Interested in learning what it’s like to advise a company, learn how it works, interact with their people and help them structure their business in the most tax efficient way possible? Find out first-hand by experiencing PwC’s fast-paced, team-based and fun Tax Challenge Business Simulation. As this event has limited space, selected students will be contacted prior to the event. CPABC is hosting a practical and informative panel about the future of accounting. 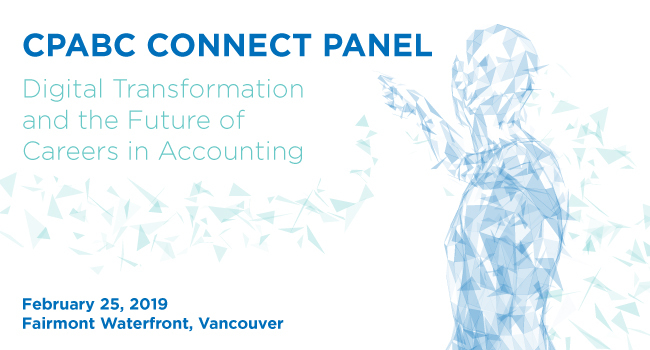 This panel and networking event will bring together over 200 CPAs and future CPAs to explore the impact of digital transformation, automation and artificial intelligence on careers in accounting. The panelists will discuss the impact of technology and how organizations view their roles evolving in the future. Panelists include senior business leaders from Best Buy, Deloitte, Galloway Botteselle and more! The networking reception will feature employer booths where students can engage further in discussion with peers and business leaders over light refreshments. The space for this panel discussion is limited so we encourage you to sign up early. As this event is complimentary, registration is required for admittance. Space is limited. Registration closes February 8, 2019.